Biking on Oahu :: diy oahu tours. things to do in oahu hawaii. 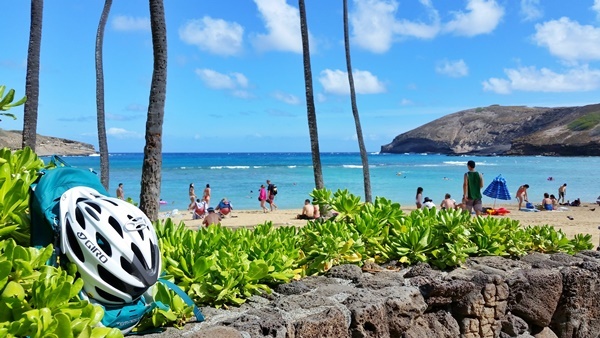 So, is it realistic to make biking a part of your next Hawaii vacation? Decent fitness and a good attitude can go a long way! You don’t need to be a superstar athlete in order to do some biking in Hawaii. If you’re up for some biking and outdoor adventures, you can create your own self-guided bike tour on Oahu. It takes a little bit of planning, but there’s a good chance that you’ll find the rewards to be great! 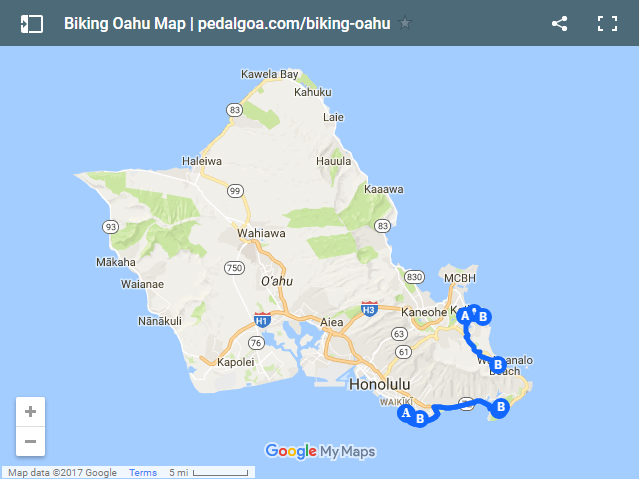 Here are a few ideas with an Oahu bike map if you’re interested in making a bike ride a part of your time on Oahu. The bike trips listed on this page can be good DIY day trips. Oahu also has a few guided biking tours too. Have a look at some of these bike tours. Also take a look at these Oahu adventure tours! When you’re exploring what routes to take, click on the “biking” or “walking” icon as your transportation mode when you’re using Google Maps directions! The Diamond Head Hike is one of the most popular hiking trails on Oahu. And it’s close enough to Waikiki that you can bike there. It’ll depend on where your starting point in Waikiki is, but it’ll likely be 2-3 miles. 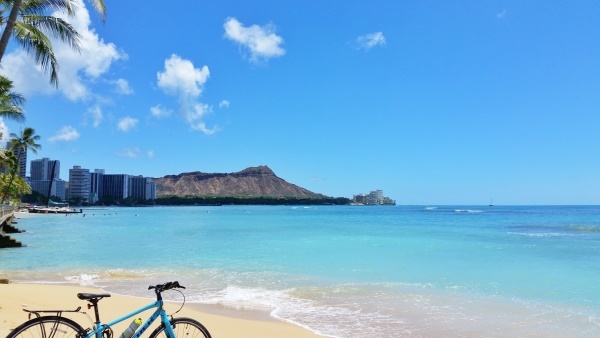 This is a guided bike + hike tour that includes Diamond Head. Hanauma Bay is the most popular snorkeling spot on Oahu. The distance from Waikiki gets a little bit further, but it can still be something that’s realistic if you’re an outdoor enthusiast. 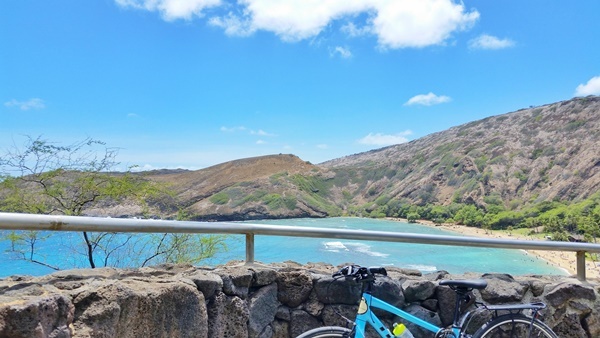 The road to Hanauma Bay will likely be busy because part of the bike ride is along a main highway. And similar to the route to Diamond Head, you can choose to go the scenic route along the coast. This will add about a mile to your bike ride. This makes the route 11-12 miles. Once you get past the Diamond Head Crater, the road is relatively flat… until you get closer to Hanauma Bay! Then there’s a little bit of an uphill battle. To minimize the weight you need to carry in your backpack when cycling, consider biking and snorkeling in the same clothes! Rashguard shirts like these and quick-dry board shorts like these can be perfect! And the shirts will provide added UV protection from the sun! The Koko Head Hike is a strenuous hike on its own! But if you are up for a challenge, you can make it a bike and hike sort of day! The path to the Koko Head Hike is pretty much the same as the path to Hanauma Bay. These two popular activities are located across from each other. From the Koko Crater summit, you can see Hanauma Bay, and when you’re snorkeling at Hanauma Bay, you’ll be able to see Koko Crater! Kailua is located about 30 minutes from Waikiki by car and about an hour by bus. 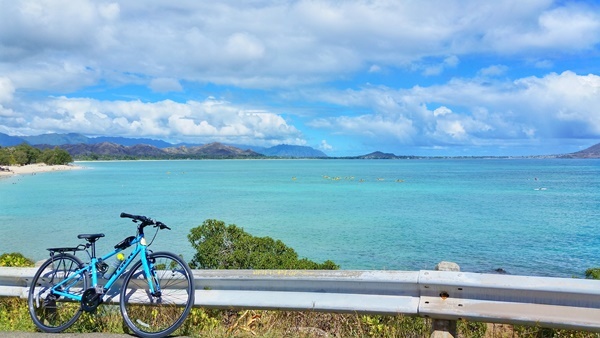 If you take a trip out to Kailua, you will likely notice lots of people on bikes. And you’ll probably see lots of bikes with baskets on the handlebars or on the rear bike rack. Most of the bikes that you see like this in Kailua are likely bike rentals. 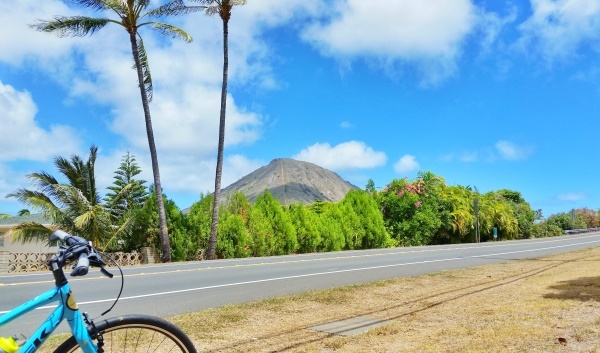 You can do the same by renting a bike in Kailua and taking a ride around town! A visit to Kailua Beach will give you scenic views of the white-sand beach, as well as scenic views of a mountain range! There is a bike path you can take to get from Kailua Beach to Lanikai Beach. Then once you get on the road that gives you access to Lanikai Beach, there are a number of different beach paths that you can take to get to the ocean. Some will lead you to the beach, and there are a couple of paths that take you to a rocky shoreline. You may consider heading down a few of the different public access paths for a look! 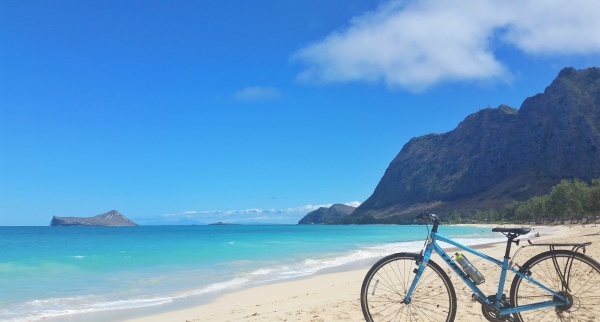 Biking from Kailua to Waimanalo Beach is an absolutely beautiful ride! It’s about a 5 mile bike ride, depending on where in Kailua you start. There is one stretch for 1-2 miles that may make you feel uneasy if you’re not used to road cycling. This is where you’re riding along a highway. The shoulder is pretty wide, but cars may be zooming past you at 60 mph, although the posted speed limit is 45 mph. Waikiki to Waimanalo Beach is about a 20 mile ride. This direction would only be recommended to experienced cyclists, if at all. There’s a stretch approaching Waimanalo Beach from Waikiki that’s a two lane highway with an extremely narrow shoulder with fast cars. This stretch has stunning views right along the ocean, but you may be too busy trying to bike safely to appreciate the coastal views! 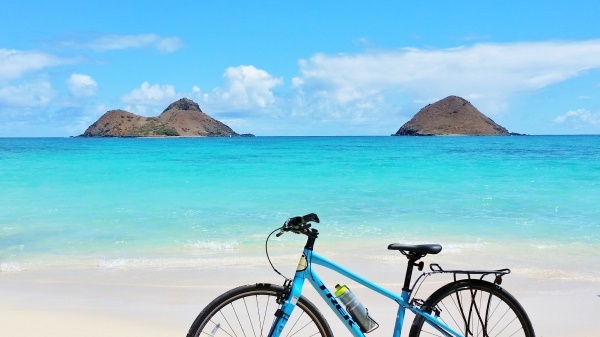 So, how can you make these bike trips on Oahu happen?! On your way back, if you just absolutely are not feeling it, you’ve also got a back-up plan in the Oahu bus system! You can transport your bike by bus for no additional cost. You just need to pay the bus fare. You will find bus stops along the routes of the bike rides listed on this page. But, the bus can only carry 2-3 bikes at a time depending on the bus. This means that there’s a chance your bike may not be able to make it on and you’ll have to wait for the next bus. This is more of a concern if you are 2 or more people. There are a number of bike rental shops on Oahu around Waikiki and Kailua. There are different types of bikes you can rent that include beach cruisers, mountain bikes, hybrid bikes, and road bikes. Also, new to Hawaii in summer 2017 is a bike sharing program. This is more ideal for trips around Waikiki and Honolulu. How it works is that you pick up a bike at one bike rental station, and then you can ride down the street to return your bike at another station. 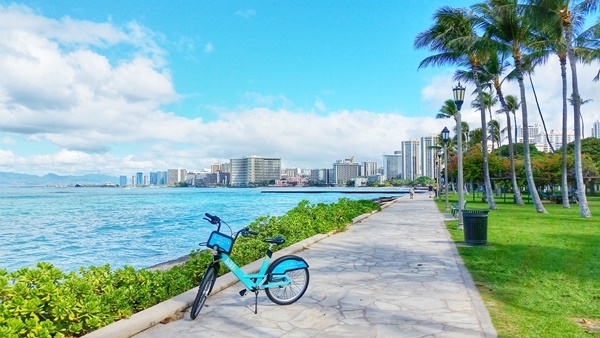 Here’s a short bike ride in Waikiki with a bike rental. You’ll want to check with your hotel to see if they are okay with you bringing a bike into your hotel room. You can also look into staying at an airbnb on Oahu too. With an airbnb, since you’ll likely be staying at a private residence, there might be more leniency. Ask about a safe place to store your bike. Bike accidents on Oahu are a thing. Biking can be dangerous, especially when you’re alongside cars. Most of the rides listed on this page require biking along some busier roads. It’s always better to be safe than sorry! Be cautious. Be safe! Bike theft on Oahu is also a thing. So be sure you lock up your bike properly. This includes front wheel and back wheel to a stationary object. If for some reason you can’t manage to lock up both wheels, always loop your cable lock through the front wheel. Front wheels can be easy to take off. You may also consider using a U-lock too for added security. Things to maybe bring for your Oahu bike ride! Bike light like one of these just in case. Even if you don’t expect to stay out past dusk, things happen! Not only is it illegal to ride at night on Oahu without a bike light, it is far safer so you can be seen! Money belt like one of these for easy access to your phone because photo opportunities come often. 😉 Also makes it easy to go pocket-free to carry cash and credit cards. Portable phone charger like one of these so you can keep your phone battery charged after all the GPS usage and photo taking! HELMET! Better safe than sorry! Take a look at these types of MIPS helmets. Although there’s debate as to whether MIPS technology actually makes a difference vs a normal helmet, the ideas is to limit the direction your head turns if it hits the ground. BIKE LOCK! U-lock to lock the frame and front wheel, cable lock to lock the frame and back wheel to a stationary object. WATER! How you want to carry your water might depend mostly on what activities you’re combining with your biking. If you know for sure there will be frequent places to re-fill your water bottle along the way, you may be fine with a travel-friendly water bottle in your backpack. This water bottle is popular in Hawaii because it keeps cold drinks cold. SNACKS! Always carry extra snacks! Even if you don’t think you’ll eat them. Having to bike back at the end of the day with no energy… NOT GOOD! Backpack with a spot to attach your helmet when you’re off the bike!